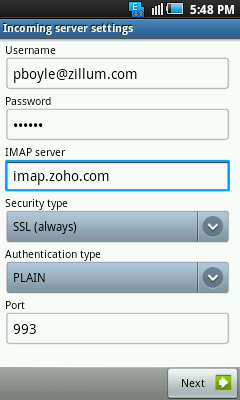 You can configure your Zoho Mail account in your Android device as IMAP. You need to ensure that you have enabled IMAP access for your account by logging into Zoho. To begin with, you need to enable IMAP Access of your account. Log in to Zoho Mail and Enable IMAP in the Zoho Mail Settings page. Save the Settings. Select “Add Account >> ‘Other“. Enter the accounts Email Address and Password, Click Manual Setup. Provide the settings for your Incoming Mail Server. In the Host name field, enter “imap.zoho.com” in the “Host Name” field. Make sure that the Authentication type is ‘Plain‘. Specify the Port as 993. Click Next. Provide the settings for the Outgoing Mail Server (SMTP). In the SMTP Server field, enter “smtp.zoho.com“. Specify the Port as 465. Provide you password in the “Password” field. Click Next. Upon successful completion, you will be navigated to Mails screen. You have now successfully configured Zoho mail in your Android. The screens may vary based on your Android device and the Mail App you use in Android. But with the exact port and server settings, the account will sync without any errors.